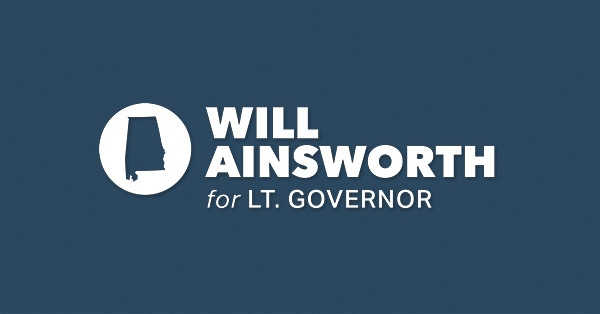 Citing a desire to create jobs, improve education, and bring a higher ethical standard to Montgomery, Will Ainsworth is seeking the office of Lieutenant Governor. Will was born in Birmingham and grew up in Boaz, raised by parents who instilled in him a core set of Christian Conservative values. His mother, Sharon, serves as director of the Real Life Crisis Pregnancy Center and taught Will to respect and protect unborn life. His father, Billy, is a respected businessman, church leader, and community leader who showed a daily example of hard work and integrity. After graduating with a degree in Marketing from Auburn University, Will returned to Marshall County and was employed as a youth pastor at Albertville’s Grace Fellowship Church, where he taught young people how to have a committed relationship with Christ. Seeking a way to turn his passion for hunting and fishing into a business, he and his brother, Austin, later opened Dream Ranch, which is now one of the most recognized sportsmen’s lodges in the United States. Will also founded the Tennessee Valley Hunting and Fishing Expo, one of the largest trade shows of its kind in the Southeast with more than 20,000 attendees annually. Elected to the Alabama House in 2014, Will championed a push for ethics reform. As a member of the House Ethics Committee, he signed Articles of Impeachment against Robert Bentley and introduced a strict term limits bill. Will also sponsored recall legislation that would allow the public to remove elected officials who abuse their office. Rather than addressing ethics violations only after wrongdoing occurs, Will has taken steps to give the epidemic of corruption affecting the Alabama Capitol Building and State House a strong dose of preventative medicine. Will is married to the former Kendall Foster, and they have three children, twins Hunter and Hays, and a daughter, Addie. When not working, he enjoys spending time with his family in the outdoors, playing sports, and teaching his children the same life lessons his parents taught him. Members of Grace Fellowship Church in Albertville, Will and Kendall teach the Young Adults Class and the Children's Sunday School Class.